Ivan Ayr’s indie feature debut “Soni” is a gentle but assertive work of social realism and a character exploration on the background of women problematic day-to-day life in India. After being well accepted at the Venice Film Festival for the “Orizzonti” section, “Soni” is having a god run in some of the major festivals and it competes in the First Feature Section at the BFI London Film Festival. The first scene immediately sets the mood of the movie. A woman at night cycles home, passing through the dark back-alleys of a suburban area of New Delhi. Another cyclist – a man – starts the catcalling routine and when harassment goes from verbal to physical, the woman teaches him a lesson and beats him quite viciously. At the arrival of the police we soon discover that the victim (of the harassment, not of the beating) is the undercover police sub-inspector Soni (played by Geetika Vidya Ohlyan) who has gone a bit too far in her mission. It is probably not the first time that happens as we guess from the animated conversation with her supervisor Kalpana (Saloni Batra). Soni has a problem of anger management and Kalpana reminds her the protocol has to be respected. Married with Commissioner Sandeep (Mohit Chauhan), Kalpana herself is going through some troubles because of Soni. Her husband repeatedly reminds her that she is too soft and forgiving with her staff, caring too much about their personal problems. Indeed, personal problems abound in Soni’s life and slowly the movie reveals fragments of her past, a past where the seeds of her rage lie. 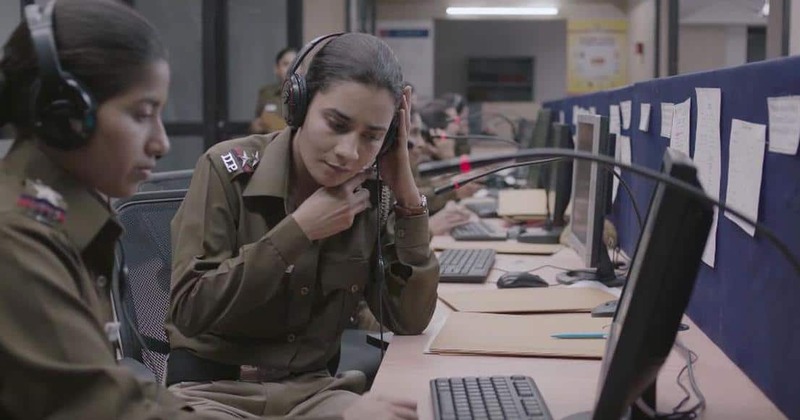 After a brief punitive spell for misconduct in the Control Room – where she learns that abusive phone calls are a normal routine – Soni is back on the field under strict supervision but this doesn’t prevent more inconveniences and pressures for the two women. When the son of an influential politician takes part in a mishap involving once again Soni, Kalpana loses all the husband support and respect and she is presented with a dilemma and forced to take a stance. “Soni” touches on so many hot themes and problematic issues of Indian society, harassment, corruption, gender divide and the constant pressure from antiquated traditions, that it gets dangerously close at times to feel slightly didactic, like a sort of educative film. However, with great measure, the movie stays firmly focused on the two protagonists and it explores their mutual interaction and their personal struggles in dealing with these adversities in everyday life. Soni is a modern and politically aware woman and is troubled by a series of small and big concerns; from the elder neighbour who cannot understand her use of convenience food, washing machine and green tea (three modern heresies!) to her choices along a personal path of self-determination. She is angry and instinctive – not a great combo for a police officer – while on the other hand Kalpana is endowed with a quiet strength that counterbalances and often clashes with Soni’s loud temper, generating tension but also empathy at the same time. Although Soni is the titular character, Kalpana is a pivotal figure; her personality is complex and multifaceted and is accurately explored in the unfolding of the drama. Of great significance is her gesture to give Soni the book “Revenue Stamp” by feminist-poet Amrita Pritam. After few scenes into the movie, its filmic peculiarity starts to show. “Soni” is in fact a collage of about 50 tracking long takes; every scene is filmed in one shot. It’s a stylistic choice that matches and enhances the fly-on-the-wall, unobtrusive style of the movie and its gritty realism. Without making a statement, cinematographer David Bolen has made a good use of subtlety and a sober brown/beige palette. Geetika Vidya Ohlyan and Saloni Batra, the two lead actresses, are little known by the big public but their work in “Soni” is terrific, they have talent and mutual chemistry and their controlled performances are in tune with the film’s naturalness. “Soni” is a soft spoken yet powerful portrait of two women and their sisterly alliance against the odds. A promising debut for director Ivan Ayr.